It's a measure of the success of Frank Lampard that 'Junior' was quietly dropped from his name soon after his move to Chelsea. When he was an emerging player at West Ham United it was necessary to distinguish him from his father, a dyed-in-the-wool Hammers player who gained two England caps and went on to coach and manage at the club. But these days it's more common for the father to be the one that's picked out, as Frank Lampard Senior, even on Wikipedia. 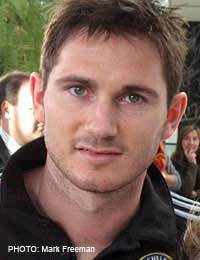 Frank Lampard is a product of a prolific youth development system operated at West Ham. His father was then assistant manager to Harry Redknapp, Frank Junior’s uncle, so for a long time Lampard had to endure taunts of nepotism. But quality was in the system, as shown by other West Ham graduates at the time: Rio Ferdinand, Glen Johnson, Jermain Defoe, Michael Carrick and Lampard’s Chelsea team-mate, Joe Cole. Lampard’s international career started at Under-21 level when Peter Taylor brought him into the camp. Scoring nine goals in total for the U21 team, he also captained them for the European Championship in 2000. By that time he had already made his full England debut, against Belgium in October 1999, but it proved to be a false start and he had to wait for another year and a half before his second cap, against Spain in February 2001. Despite gaining five more caps over the next year or so Lampard was not picked to go to the 2002 World Cup in Japan and Korea. By his own later admission, he was still learning his craft, and that learning and been accelerated by his move to Chelsea under Claudio Ranieri in May 2001 for £11 million. Although this released Lampard of pressure from accusations of favouritism from his father and uncle, it introduced the pressure of delivering against what was then a fairly high transfer fee, but slowly and surely Lampard rose to the challenge. Steady improvements in his England displays gained Lampard caps more frequently but with England’s midfield strength in depth it was hard to for him to forge a permanent place. He did, however, play in many of the qualifiers for Euro 2004, the next major competition, and was duly selected for the squad. This was probably Lampard’s best time in an England shirt so far; he backed up solid midfield performances with three goals in four matches (England went out at the quarter-final stage, to hosts Portugal) and was selected for the official tournament All-Star Squad by UEFA’s technical study group. One of the Best in the World? Another player, Wayne Rooney, emerged on the world stage at that tournament and took most of the headlines, but Lampard impressed on the quiet, something that was demonstrated by him winning the UK Player of the Year award ahead of Rooney. This performance and his increasing importance to an emerging successful Chelsea side also saw Lampard being second place to Ronaldinho in both the European Player of the Year award and FIFA’s World Player of the Year award for 2005. After Euro 2004 Paul Scholes announced his retirement from international football and this made room for Lampard to consolidate his place in the England team. He was ever-present in the team throughout qualification for the 2006 World Cup, scoring vital goals along the way. Qualifying was the usual England heart-attack inducing affair, with defeat by Northern Ireland the lowest point of a campaign dogged by the antics of manager Sven-Goran Eriksson and the English press, but a strong team went to Germany in the summer of 2006 with high hopes and expectations. Unfortunately the expectations were not to be met, especially for Lampard. Although a midfielder rather than a striker, both Chelsea and England fans have come to expect goals, but he did not score and was woefully off-target with many attempts. He was also one of the players who missed a penalty in the shoot-out against Portugal that saw England exit at the quarter-finals (Jamie Carragher and Steven Gerrard were the other unfortunates). In addition to the lack of goals it was apparent that the problem of how to play both Lampard and Liverpool's Steven Gerrard in the same team had not been resolved. Throughout the unhappy tenure of Ericsson's replacement, Steve McClaren, and the failure to qualify for Euro 2008, Lampard kept his place in the England side. But under Fabio Capello the team is more balanced and Lampard's eye for goal returned during the successful 2010 World Cup qualifying campaign. Lampard should be at the top of his game in 2010 and he has expectations to live up to. Jose Mourinho has claimed that he is the best player in the world and both the legendary Brazilian Carlos Alberto and the even more legendary Dutchman Johann Cruyff are on record as saying that he is one of the best midfielders in Europe. At the World Cup in South Africa he has an opportunity to prove these claims have foundation.